I love that story of the young Jesus. I’m not a parent so I cannot appreciate the worry they must have when a child turns up missing, but I can appreciate that this child wandered to the place where God would be: His father’s house, gathered together with those who could teach him about the Father. I love family gatherings! Indeed on the weekend before my 59th (egad!) birthday just one week ago, my siblings gathered as family with assorted spouses and children in a big house in the sandhills of Nebraska to celebrate our Christmas. It’s the only way the Colorado Prescotts and the Nebraska Prescotts can meet halfway in neutral territory where no one has to host, but everyone contributes. It is reminiscent of Christmases in our youth when we would gather at Grandpa Piskac’s house with all the cousins. When the George Prescott clan grew to seven children, that gathering was eventually moved to the George Prescott house. When the family kept expanding with grandchildren and cousins and second cousins, and the responsibility of hosting grew ever larger, it moved to the house Jana and I purchased for just that reason on Chicago Street. That tradition eventually disappeared as families kept expanding and wanted to start their own Christmas traditions. Over all those years we lost so many of the familiar faces who would make those gatherings so special. Bubby Piskac. Grandpa Piskac. Aunts and uncles and eventually our own dad who left us in 2007, and our own sister Cathy, the baby of our family, in 2013. For the six of the George Prescott children who remain after the loss of our Cathy four years ago, it is still important that we do gather. And so we meet at the lake. We cook. We eat cookies! If the weather is good like it was this year, we hike. We look for eagles. We laugh. We hug. We gather. The family gathers. I know of other families who gather as well, and they gather in the Father’s house. I have watched over the last two days as the family of God has gathered in Basra, in Homs, in Aleppo, in Mahardeh, in Hasekeh, indeed all over Syria and Iraq. 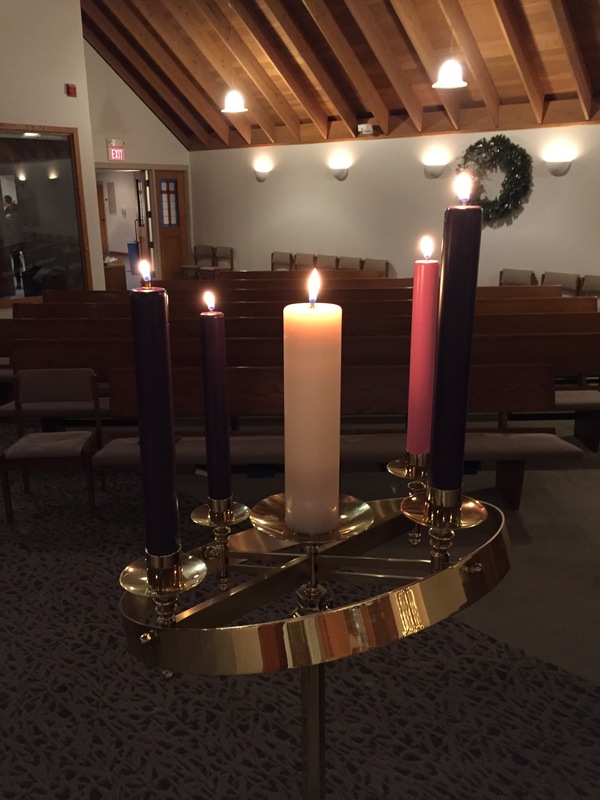 With all of the loss they experienced though years of war, they still gather in the house of the Father, light the Advent candles, sing the carols, lift the prayers, and welcome the Christ child into their homes, their lives, their hearts. 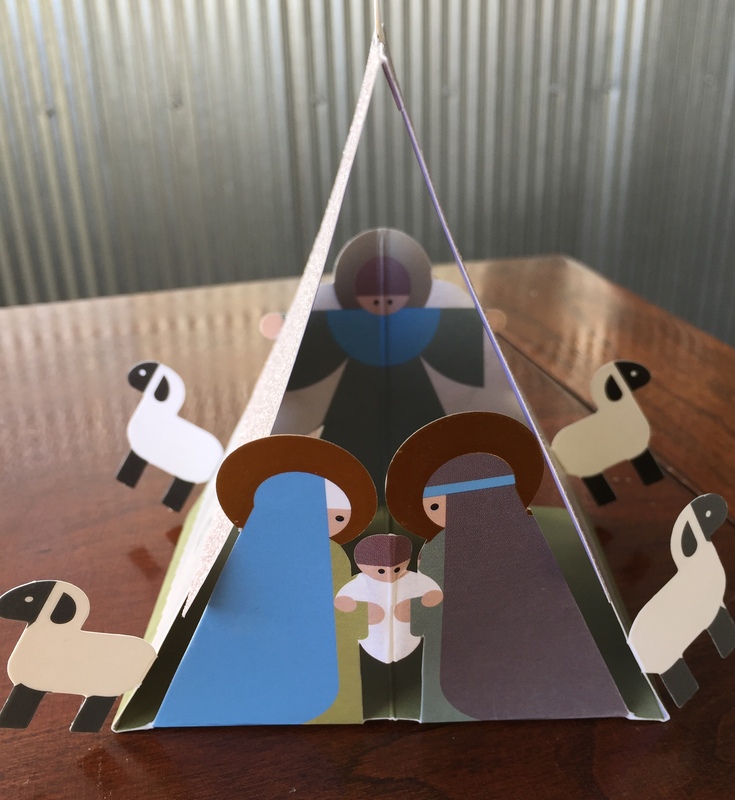 They follow the star to where it leads…the incarnation of God lying in the manger. For me, it is the family gathering at church on Christmas Eve, that is the best gift of Christmas. For my church, West Hills in Omaha, this has been a difficult year. Though a difficult transition in leadership, many have left. Elders like Steve, who built so many VBS sets that transformed the building into castles and swamps and airfields. Leisha, who traveled with Steve and I to Germany on our honeymoon mission trip. 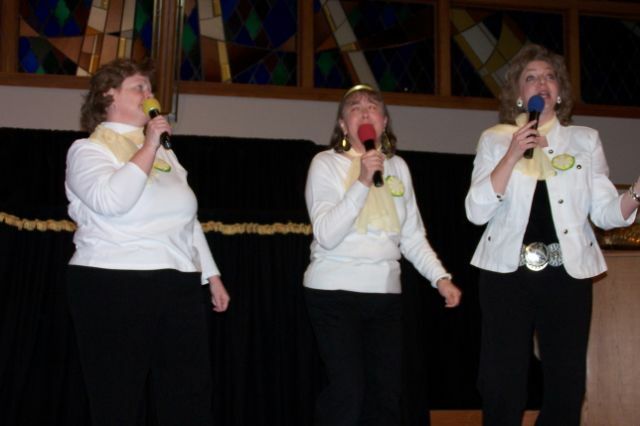 Gene, Janet and Barb, who all served in worship and music. Oh! How their voices are missed in the choir. Henry and Paul who worked so hard on making our building welcoming and well kept. So many others, too numerous to mention…all missed and not gathered with us on the twenty-fourth as we lit the candles. When the family gathers, we miss the ones who are not present, even as we revel with the ones who are. Sitting in the choir loft last night before the service began, I was feeling the joy of that night just as I have for so many years. And then the gift appeared. Melissa, whose family had departed back in the early spring, came up on the chancel to hug our organist. I blinked twice to clear my eyes. Yes! It was Melissa! Which meant that Kevin was there as well. When the service was over, I found them all for Christmas hugs, and thanked them for being there. Mia is Kevin and Melissa’s high school senior daughter. She had been raised at West Hills and confirmed there just a few years before. This is the church – the family – that she has spent Christmas Eve with for as long as she could remember. Where else should they be, but the Father’s house? 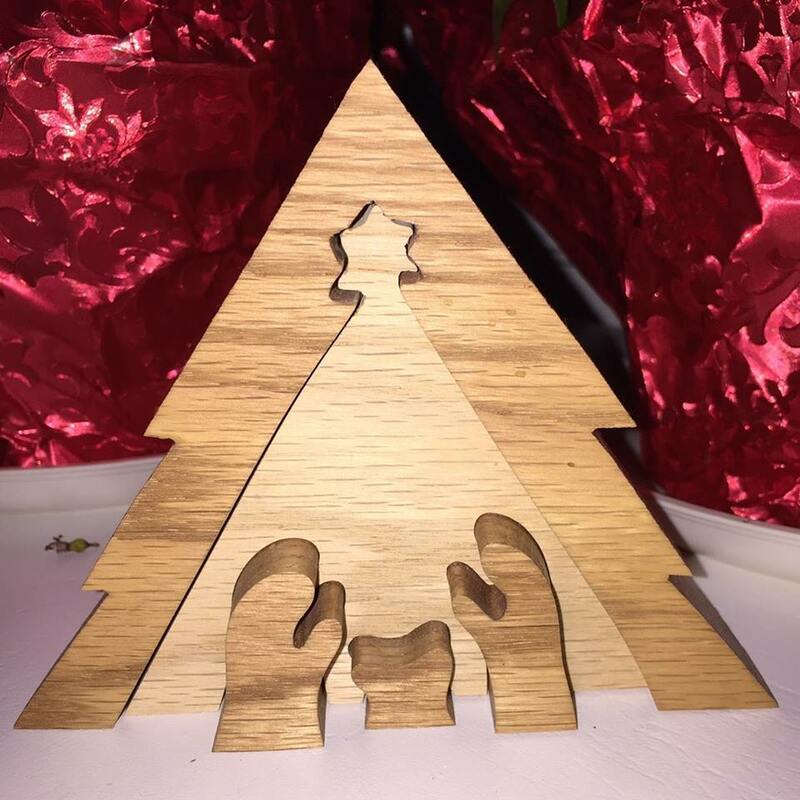 As we know, Christmas is not about the presents. It’s about the presence. And as the family gathers, presence is a gift. So eat the cookies. Light the candles. 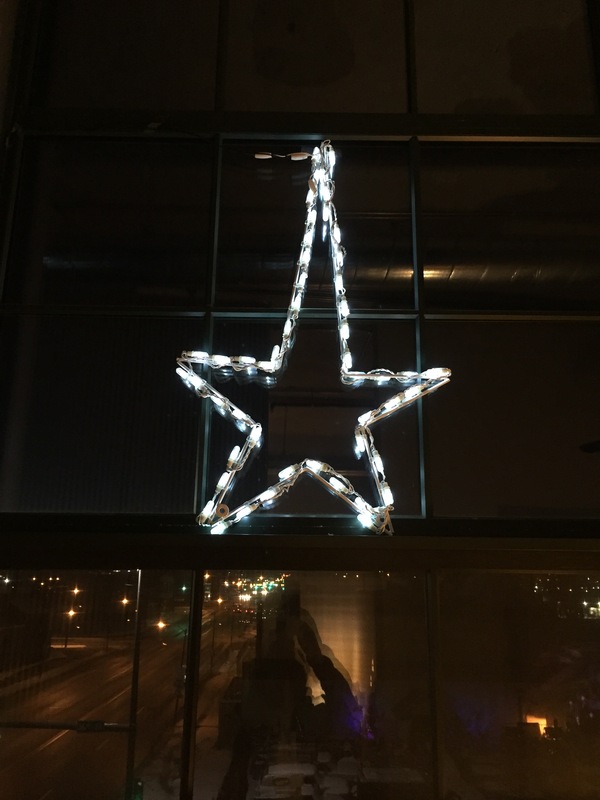 Follow the star…to the manger, to Grandpa’s house, to the Father’s house. It’s 12:55 a.m. on Christmas morning. I just came home from the late Christmas Eve service at the church next door to our house, a tradition I began about nine or ten years ago when the services at our church were moved to earlier times. It’s a short walk to Dundee and I love being an anonymous worshiper in a church where I know practically no one. It is always a blessing to see the people I do know, Meri and Ron Crampton, and to give them a Christmas hug. Tonight I walked out of the church with another Ron I know. His wife Tami was sick, so if you think about it, please say a prayer for her healing. Christmas at West Hills was bittersweet. There were glorious moments of praise on this night as we sang “Joy to the World,” “Silent Night,” and other familiar carols which take me back to the earliest Christmases I can remember. Our dear Michael Dryver soloed on “O Holy Night,” and did it in a way that would have put you right there in Bethlehem. It is my favorite Christmas carol, and I especially love the third verse: Truly he taught us to love one another. His law is love and his gospel is peace. Chains shall he break, for the slave is our brother, and in his name all oppression shall cease. The bitter came as I reflected that this would be the last Christmas Eve service I would get to share with Nicole and Mike Geiler. There they were, seeing to all the details of a wonderful service. They didn’t miss a beat. They love Jesus and they have helped us celebrate his incarnation for all these years. I don’t even want to think about next year. Steve, Jana and I were the Advent candle lighters and readers for this night. And I know in the bitter and the sweet that lighting that center Christ candle is the visual symbol that he is the light of the world and the darkness does not overcome it. And that reminder came in the sweetest of forms as I watched the global church celebrate Christmas in the hours before I did. Nine hours east of Omaha came the posts from Basrah, Iraq. Merry Christmas Zuhair Fathallah and all the faithful there! And in the darkest of places on the world stage these days, in places where I have been praying for God’s gospel of peace and for the ceasing of all oppression, came the posts from Syria. Mathilde Michael Sabbagh leading in the children to the sanctuary in Hasakeh singing pa-rum-pa-pum-pum. And there was Assis Salam Hanna of Latakia soloing in a bass voice on O Little Town of Bethlehem, and I didn’t know he could sing! Elias Y. Ousta Jabbour was playing the keyboard, and that song had an awesome beat. Tami Dekrmnjian Nseir had posted a video earlier of the church in Aleppo singing “Silent Night.” Can you imagine? A silent night in Aleppo. So here it is Christmas in Omaha and I am celebrating the reality that the word was made flesh and moved into our neighborhood, into Basrah, into Hasakeh, Latakia and Aleppo, and indeed the whole world. That word was the light of the world and all the darkness in it yesterday, today and tomorrow, cannot and will not overcome it. O holy night, the stars are brightly shining. It is the night of the dear savior’s birth. That’s my trip journal for four trips to the Middle East. The spine is busted from stuffing it full of inserts of hymns, printed prayers, photos and bios of my teammates, devotionals I’ve led and other memories on paper too important to discard. I was looking through my dog-eared, spine-busted journal tonight for an email address. There are so many inserts into this broken-backed book! And while I found the email, I also found this. On this night, before I begin my journey into a master of arts study of ministry at Creighton University, it reminds me of one of the big reasons I am stepping out. I wrote this article in May, 2013, shortly before my second trip to Lebanon. I am so happy to share it tonight. There is a difference between heartburn and a heart that burns. The former is felt usually around some poor eating habits or gastrointestinal issues. It’s very uncomfortable if you’ve ever experienced it, but you can take a pill. The latter can also be uncomfortable, but I would describe it more as comfort-afflicting. If your heart has ever burned for something or someone, your only response is action. If you don’t do something about it, it just gets worse. There is no magic pill. My heart has burned for the situation across the Middle East since I was in high school and my step-brother Charlie worked for NBC News in Lebanon, covering their civil war which raged for fifteen years. Every night we would watch the news and see pictures of the atrocities that Charlie had stood in the midst of to get the story to us in the U.S. It was hard to watch and understand why these things went on, but more than anything, we hoped Charlie would be safe. Then I met Marilyn Borst of The Outreach Foundation and she was taking a group of faithful women to visit the churches of the Synod of Syria and Lebanon. We would travel to Beirut and visit the churches founded by missionaries in the 1800s. We would travel to Damascus and Aleppo in Syria, doing the same. We shared worship. We shared time at a women’s conference. We were welcomed into their homes. We shared coffee and tea and sweets. We met with Iraqi refugee families who were being cared for by the church. We heard stories of courage and of love and of faith, a faith lived out for over 2,000 years. And I came home with new friends and new connections in this global gathering we call the Body of Christ. And my heart burned to return, to be back in the company of those women and those churches, to share life together again. And we would have returned the following year, 2011, but once again, war broke out. This time the war was in Syria – first an uprising in a small town, now a two-year old war – and we couldn’t go back because it wasn’t safe…for us. It’s not safe for them either, but they live there. Or they did. The Presbyterian Church in Aleppo, Syria, where we sang Amazing Grace and shared with the families who were caring for Iraqi refugees was completely destroyed in November, 2012. We got this news from synod officials who had traveled to be with us in a large gathering in Erbil, Iraq. Those of us in that room who had worshipped at the church in Aleppo were grieving: grieving for the ministry that would no longer be done in that neighborhood, grieving for the plans of the renovation of a Christian high school that would have served all faiths, grieving for the work that Assis Ibrahim and his congregation had done together as incarnational witnesses. Their church home was destroyed, many of their own homes were destroyed, their jobs were gone. Those who cared for refugees were now refugees themselves as they fled to safe parts of their country or to Lebanon. In some of Paul’s epistles he refers to a collection for the church in Jerusalem. The churches created from his and other missionary journeys were collecting money for the benefit of the persecuted church there. The Outreach Foundation and other churches in our denomination are doing the same thing for the present day persecuted churches in Syria. They are collecting money to send to the Synod of Syria and Lebanon to aid these now displaced brothers and sisters in the small but important ways they can. And the people of our church have responded to that plea in the form of a $10,000 gift granted by our Mission Team. And my heart burns with gratitude at this response. We are not called to suffer as they have been. But we are called to stand with them: to show up when we can, to release the resources that God has provided us to be used in their time of need. This burning heart of mine will return to Lebanon in May. My prayer is that these people of God will know his peace that passes all understanding. That they will be comforted by his gracious Holy Spirit. That they would have abundant life restored to them. That they would continue to shine the light of Christ wherever they are. And that they will be strengthened in this time of trial. And now in January, 2016, I am happy to reflect back on this. The church building in Aleppo has been rebuilt in a safer place and the saints worshipped there for the first time on Christmas. The church body never stopped meeting, climbing five flights of stairs to meet in an apartment together for the last three years. The Aleppo College for Boys, that Christian high school, has never closed its doors during the continuing conflict, now approaching its fifth anniversary. It continues to be a place where Christian and Muslim learn side by side. I have traveled back to Lebanon three times and to Syria twice. Steve and I will be returning to both again this spring. And the inspiration of the church in persecution has put a vision of ministry in front of me, and the fulfillment of that vision begins tomorrow night when I take my first class at Creighton University. May God continue to cause my heart to burn, and may he inflict you with that as well. “525,600 minutes…how do you measure a year?” Jonathan Larson did the math for me when he wrote that beautiful song in his musical Rent. 365 days times 24 hours times 60 minutes equals 525,600 minutes in a year. And today on the first day of 2016, I want to look back and see how my 2015 was measured. A San Francisco cable car holds 60 people. This blog was viewed about 3,400 times in 2015. If it were a cable car, it would take about 57 trips to carry that many people. There were 102 pictures uploaded, taking up a total of 761 MB. That’s about 2 pictures per week. The busiest day of the year was January 26th with 189 views. The most popular post that day was Not as she died, but as she lived. I write the blog for me, but it makes my heart feel joined with you when you stop and read my words, so thank you. If I say something that triggers a response – good or bad – please take a moment and comment. My two most faithful commenters are my writer sister Sally and a sweet padre I have never met named Michael. Interestingly enough, Padre Michael is going to marry Sally to Robert in April so we will both get to meet him! My sister Susan took this picture as walked on my birthday. 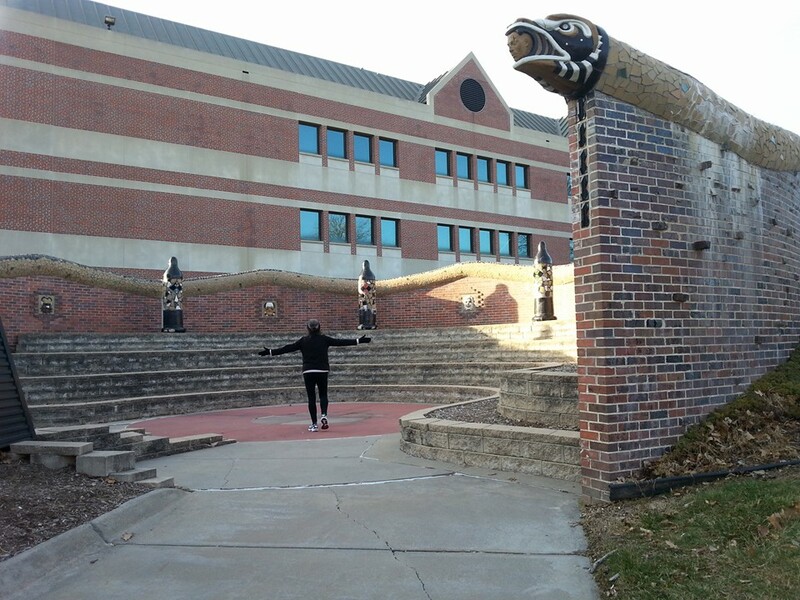 On UNO’s campus, it is the Castle of Perseverance, one my favorite places. My walking app, MapMyWalk, also measured my year. I really started walking seriously in August after I returned from the Middle East. MapMyWalk logged 322 miles on 82 walks that took a total of 88 hours and amounted to 771,000 steps. I lost twelve pounds and hope to lose another ten in the next year. It was a resolution I didn’t make in January! Flanked by Rev. Kate Kotfila of Cambridge, New York, and my new friend Mahsen, from Hasakeh, Syria, we fold peace cranes together. 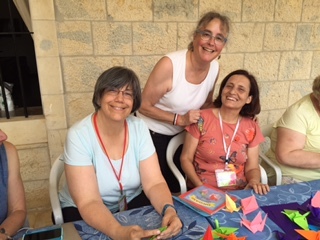 I made my eighth trip to the Middle East, traveling to Lebanon with my mentor Marilyn Borst as she led a group of faithful women on behalf of The Outreach Foundation. We spent blessed precious time with our counterparts, women from Presbyterian churches in Lebanon, Syria and Iraq. We worshiped. We had communion. We laughed and cried. We went on a memorable field trip to a Bekaa Valley winery on three buses and each bus rang out with singing and shook from dancing. 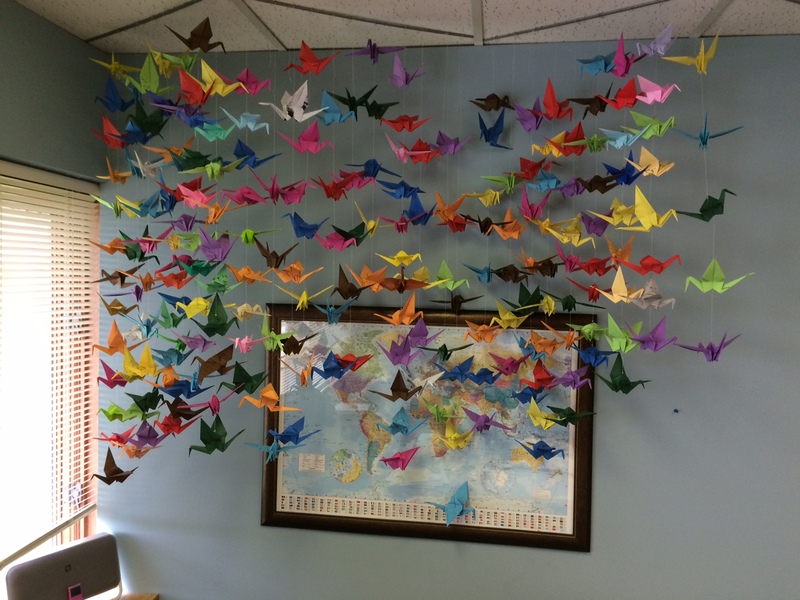 We folded paper cranes for peace together on a quiet porch in hot weather. One hundred women with ten thousand stories to tell of love and loss. Besides the cranes I folded there, I have folded 500 here at home, with 500 more to go to make my 1,000. Each one has been prayed over at least four times: as I write the name or memory on the paper, as I fold the paper and rewrite the words on a wing, as I string them together in strands like rosary beads, and as I hang them in the flock in my office. The first 323 had two additional prayer times: as I removed them strand by strand from the church office where they flew initially and the rehung them reverently in my office at home. Dona nobis pacem. Dona nobis pacem. Dona nobis pacem. I can measure this year in uncountable songs. The worship set that plays randomly in my ears as I walked those 771,000 steps. The choir anthems sung on Wednesday night rehearsals and most of the 52 Sundays in the year. Hymns and praise songs on Tuesday night worship team rehearsals with two or three voices and an amazing band that are lifted to the glory of God on Sundays as well. Singing Handel’s Messiah for the eleventh time in thirteen years with the Voices of Omaha, a choir this year of 165 voices. We finished the addition to our home so that Jana can have a safe place to live. No more stairs for her to go up and down. Her seizures make that a gamble for her safety we could not live with. In the process we said good-bye to a tree that had been planted in Daddy’s memory. My Aunt Heddy died on Christmas day. She was my dad’s last sibling and she lived for 95 years, longer than either of her parents and all of her four siblings. She taught me how to embroider when I was a little girl and she became my mentor and guide into the world of quilting. Sami Sadeeh was killed in Syria, defending his country from rebels. He was one of four national guardsmen who watched over our safety as we journed through Syria in 2014. God rest his soul. My friend Hala, a religion teacher and a preacher who lives in Beirut, lost her father. He died in Aleppo, Syria, and she could not be there to say good-bye because of the war. May God continue to comfort her as she lives not so far in miles from her mother and siblings, but an uncrossable distance in time of war. I left a job I had held for ten and a half years as director of Support Ministries at West Hills Church. It was my own decision and I was and continue to be at peace with it. In those 525,600 minutes of 2015, there were celebrations, too! Steve and I marked thirteen years of wedded bliss. We opened the year with his 57th birthday and closed the year with mine. All my siblings – the Omaha ones and the Colorado ones – made it to 722 N. Happy Hollow to celebrate Christmas together on my birthday weekend. 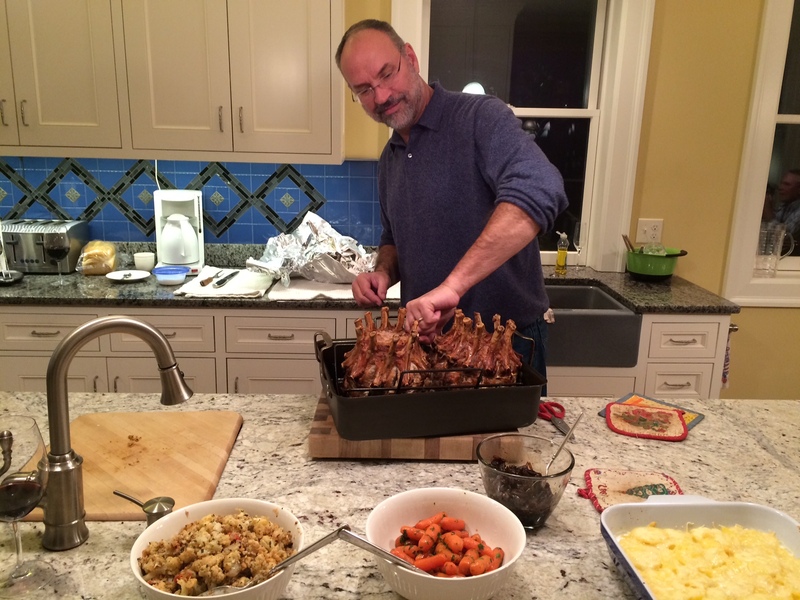 All these moments were marked with Steve’s amazing cooking and good bottles of red wine. Even as I get ready to step into a new year of adventures – back to school for goodness sake! – I marvel at this year that was. And the thread through the whole 525,600 minutes is the faithfulness of God experienced in whatever place I was standing in each of those minutes. And I know that this golden thread of his love will continue to weave and tie and hold together the minutes of life to come. So happy new year. And it’s leap year, so we get 527,040 minutes. I know they will be as full and memorable as the last 525,600. I am really enjoying this medium of the weblog. It gives me a chance every day, if I take it, to put down stories of people I know or have known or places I’ve been so I remember them once again. I am a collector of memories, but they are all collected in my head and heart. I have bits of flotsam around that remind me of some of them, but others just come to me at odd moments. As I was reading through some of what I’ve written over the last three weeks, it seems I need to write about George and Germany. George Moore was my pastor for 18 years at West Hills Church until he died November 24, 2012. For the almost eleven years I worked for him, I called him my pastor, mentor, boss and friend and he was all those things. He was also the one who showed me what it really means to be on a journey with living Christ. My eyes were really opened to this when I signed up to be a part of the team that went to southwest Germany in June, 2000. There were sixteen of us on that team and we had two full weeks together. There was George, of course, leading us with his wife, Pam. Dwaine Price, who was our choir director at the time, came along. Leisha Eiten was the elder for mission, and she along with me and my sister Jana, formed a trio of “maiden aunts” also known as the “unholy” sisters because we were not nuns! Priscilla Powell and I came to know each other and she would later be my best woman when I married my Steve. Steve Thedens, who can quote entire passages from Monty Python routines, shared the back seat of a Volkswagen van with me for many miles and I heard them all! Hank and Marna Davidson, Karen and Loren Loibl (Karen and I share a birthday), Gwen Mason, Linda Schuchmann, Randy Hess and Char Srb rounded out the team. I list them all because that was the first thing I really experienced on this trip: a community bound together in our love of Christ and the idea of incarnational witness. Our love for God and our fellowship together was lived out loud. We opened ourselves to each other in love, in fellowship, in honesty and vulnerability. It was an expression of the body of Christ that I had never known or opened myself up to experience before then. And two important words that I learned on this trip: Glaube and Liebe, faith and love, and their inseparability that I have experienced over and over again on other travels. I traveled to Germany twice more for West Hills Church. In 2002 after Steve and I were married (six weeks later!) we took our honeymoon mission trip there, repeating the steps of the 2000 journey, which Steve was not on. Leisha came with us as elder/chaperone. We still laugh about that. Once again we stayed in homes with friends we had made in 2000, members of the Evangelische Kirche (protestant church) in Öhringen, near Stuttgart. It was post 9/11 by then, and we had amazing conversations with pastors and others about our president’s careless use of God’s words: You’re either with us or against us, he said. Having conversations with those from other places about faith was part of my learning experience on this journey. 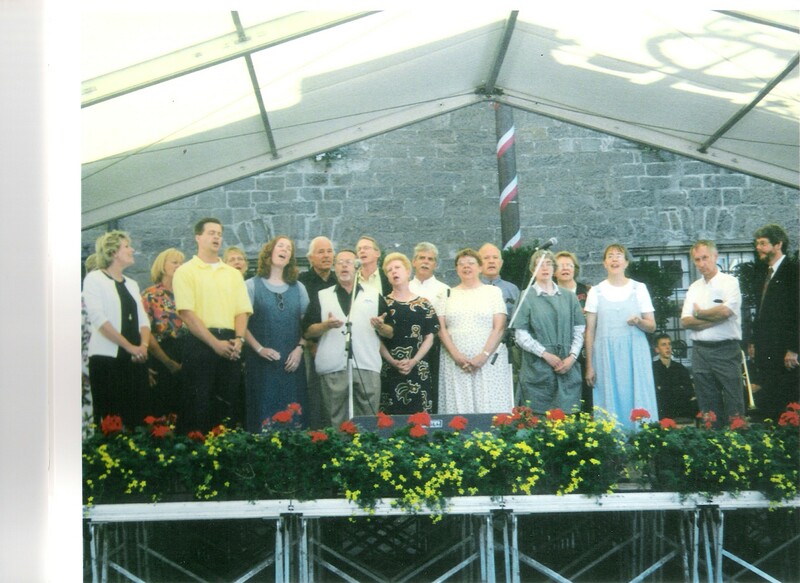 In 2005, we returned again as part of the choir, where we spent a day at Dachau. I was the chaplain on that trip and also the mission coordinator for West Hills. My mentor and pastor George had prepared me well to have an experience of God that allowed me to lead worship for our group in scripture and song. “Precious Lord, take my hand,” we sang as we had experienced the last steps of many who were led to slaughter in gas chambers and ovens. Who else would take their hands? The Twenty-third Psalm became more than just a scripture to be read at funerals for me there. “Even though I walk through the valley of the shadow of death, I will fear no evil. 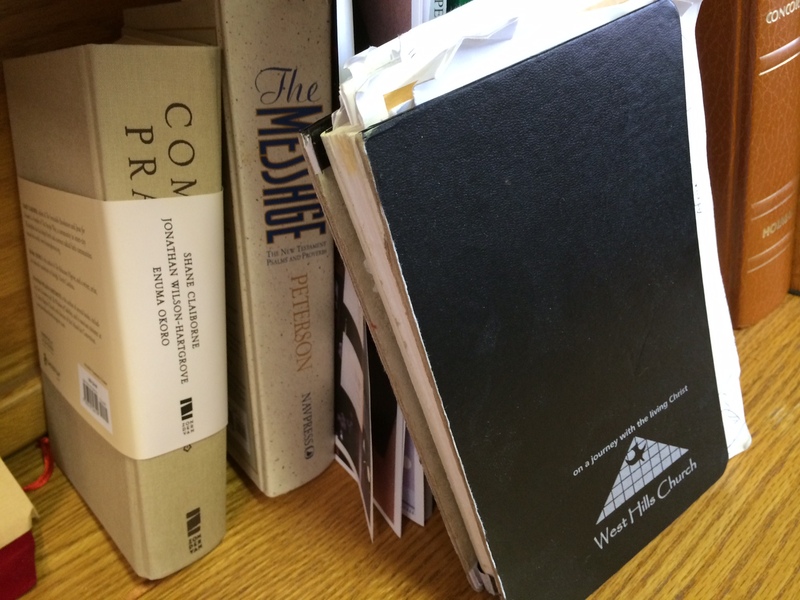 For thou art with me.” I could hear the voices of people speaking those words in context. On a quiet Friday here in Omaha, my mind wanders and these memories come flooding back like they happened just yesterday. They are as fresh and alive even now. My journey with the living Christ continues as I experience new family relationships in the Middle East. But it goes back to George and Germany and I needed to put that down today.